France, the world champion of 1998 and a tournament favorite this time round, knocked out Messi’s Argentina this afternoon thanks to two fabulous Mbappé goals and mostly controlling football in one of the best matchups of the World Cup so far which saw a total of seven goals. 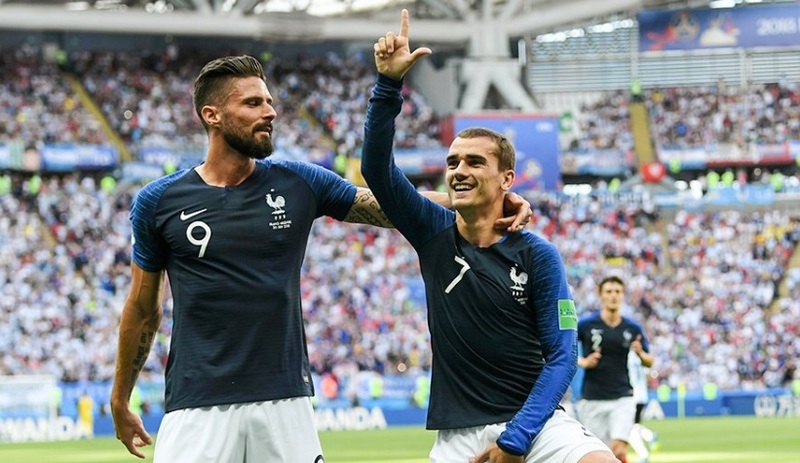 During the first half, Argentina never looked like it could dictate the game as it trailed France after only ten minutes when Marcos Rojo made a penalty foul on the fast sprinting attacker Kylian Mbappé and Antoine Griezmann put France ahead. 1-0. French coach Didier Deschamps then won the match on the middle field as his team controlled most of the central play whilst the Argentineans were left to chase the ball. His team played like it did during their own European tournament in 2016, very controlling and rather boring to watch, but of course, that’s how you can also become World Champion. Shortly before the half, PSG’s Argentinean midfielder Angel Di Maria struck a fantastic shot from far afield which left French goalkeeper Hugo Lloris without any chance. 1-1. Three minutes into the second half though, superstar Messi shot on goal and even though his strike seemed to go straight into the hands of the French keeper, it was deflected at the very last moment via Argentinean player Mercado. 1-2 for Argentina and for the first time during the tournament, France trailed another team. It all looked lost for the French at this point until, just ten minutes later, 22-year-old Benjamin Pavard, who plays as a defender for German team Stuttgart, struck with a wonderful shot in the far crossing. 2-2 and most commentators at this point agreed they were looking at one of the best matches of the world cup so far. Another ten minutes later and it was once again the speed of the young French attacker Kylian Mbappé as he sped across two Argentinean defenders the pass the ball underneath the keeper. 3-2 for France. The South Americans, with about 20 minutes left, now had to come and the field opened up even more for the fast Mbappé. Just four minutes later he sped across defenders again and scored a second time. 4-2. As the match progressed, the South Americans clearly got more agitated and emotional but were unable to budge the French defenders who simply let time run out. With about 3 minutes left, Argentinean striker Aguero brought the South American fans back to life as he scored with a header. 4-3. A tense last two minutes didn’t change the score anymore though and France goes through to the quarter-final. They will now face off against the winner of Uruguay – Portugal. Football enthusiasts are already looking forward to a possible Mbappé versus Ronaldo matchup.